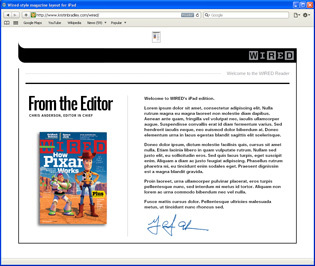 In May 2010, WIRED released the iPad edition of WIRED magazine. 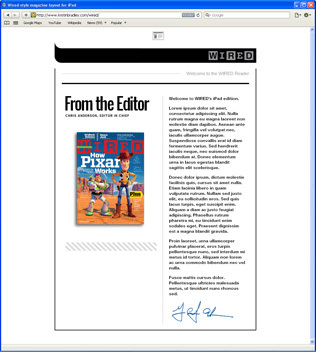 Currently each edition is produced using Adobe InDesign. I decided to see if I could re-create a few of the page layouts from the “iPad Edition Free Preview” included with WIRED’s app using semantic HTML5 and CSS3. Since I don’t own copies of any of the fonts WIRED uses, I made do with a couple somewhat similar but much less nice-looking fonts from Google Web Fonts. View live in a new window. NOTE: Since these layouts are intended for view within iPad, they were tested only in Safari and Firefox browsers. I recently researched how to print table headers on every page for long html tables spanning multiple pages. Following are my findings. Firefox prints table headers on each page automatically as long as table is formatted with th tags wrapped in a thead and the main table content wrapped in tbody. After adding these styles, Table headers printed on all pages in IE7 as well as Firefox. Headers still wouldn’t print in Chrome, Safari or Opera however. I couldn’t find an official bug report for Opera but so far it doesn’t appear there is currently a way to enable printing table headers on multiple pages. So until Webkit and Opera add support for this feature, only Firefox and IE6+ enable printing table headers on every page out of the browsers I tested.